For those of you who have been waiting for the print version of Home, James to be released, I have great news: it’s here! Home, James is now available on paperback through Amazon. Grab yourself a copy today! You can also buy a copy as a gift for an expat family you love, or for friends and family who’d love an entertaining glimpse into the world of a kid in global transition. And in other exciting news… I’ve received my first piece of fan mail! 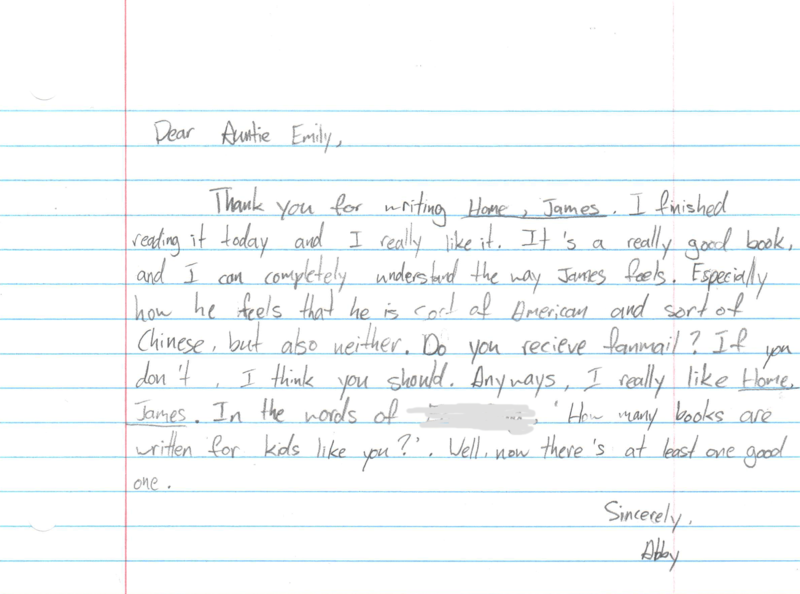 It made my day when I got this sweet, handwritten note from Abby, an American girl living in China. She really resonated with James and his story. Here’s what she had to say. I love it! I think I should frame, it, don’t you? Thank you, Abby, for taking the time to write me. I’m so glad you enjoyed the book and could relate to James. I always enjoy hearing from readers, so if you’d like to send me a note to tell me what you thought of the book, or ask questions, please do! You can reach me at emily@emilysteelejackson.com. I look forward to hearing from you. Lastly, if you’ve wondered things like “How in the world did you manage to write a book while packing up your life of 12 years?” or “How was writing Home, James therapeutic for your own cross-cultural journey?” you are in luck! I was asked those and other excellent questions for my very first interview for Home, James over at Third Culture Mama. You can check out my answers and get behind-the-scenes info on the story. Thank you, and Happy Reading! YAY Emily! I hope it’s sold at the conference this summer. I ay buy some copies to share at Via Church, too!